Are you a family? Do you like inoffensive comedy? Boy, do we have something for you! The usual mix of films for Thanksgiving weekend is some kind of action blockbuster, a broad family comedy (possibly animated) and a prestige drama (and maybe some other forgettable films). This year, the wires all got crossed, and we get three family films – two in 3D, one in CGI, and another in... felt. Yes, The Muppets make their (hopefully) triumphant return to the big screen this weekend, 12 years following the decent but dismal-box office failure Muppets From Space. This film is something close to a reboot, positioning Kermit, Miss Piggy, Animal and company as forgotten figures in show business, who are in danger of losing their theater (poor management was always a staple of the show) to a greedy developer. 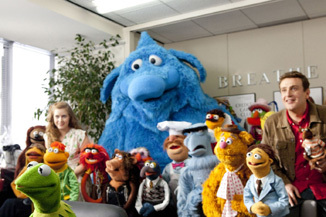 In steps Jason Segel, sort-of-but-not-really playing himself (who, as you may remember from Forgetting Sarah Marshall, has previous experience with puppets), and Amy Adams as shy fans of the troop, who try to help the Muppets get back on their, uh, feet.